As the most traumatic and potentially disastrous moment in our national history, the Civil War continues to be a most important subject for our citizens to study and understand. The program design incorporates many period costumes, uniforms, and martial equipment to act as 'realia' demonstrations of the period. 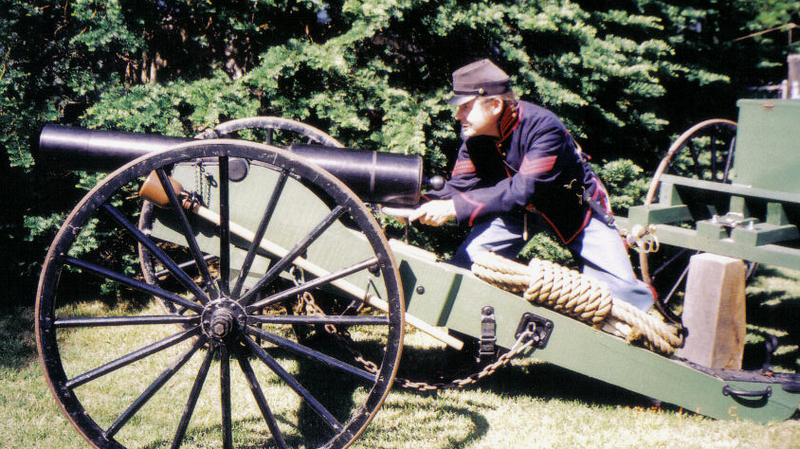 A full size cannon and limber demonstrates artillery capabilities and asks many questions in the topics of math, physics, logistics, and engineering. The students will prolong/traverse each piece to various firing points, on both flat and hilly ground, prepare the cannon for firing and execute a firing order of drill. As a working air-cannon, it fires small non-exploding rounds and canister shot by means of electrically ignited aerosol gas. The industrial 660 aluminium of the cannon has been x-rayed for safety and the piece is certified safe for all public displays. The work and demonstrations of the student firing teams is perfectly safe, though exhausting and always thrilling. All students will be instructed in the fashion of drill for this period. They will carry broomstick rifles, march in columns, and be taught the order of fire and battle dress. The larger the group the greater opportunity to stage a mock battle between two opposing companies of soldiers. As an indoor exercise, the Battle of Gettysburg is a workshop option. This 'work in progress' incorporates the use of an eight by twelve foot geographic floor model of the Gettysburg area over which students will be both taught the battle and asked to engage in paired segments of the three day fight. They will act as generals on opposing sides and 'map and fight out' twelve of the most significant elements of the battle before joining en-masse to stage out the entire battle. They will come away not only with an understanding of the historical battle and its importance to American history, but also a rich appreciation of what the men of that period experienced as soldiers in what historians call the first 'modern war'.